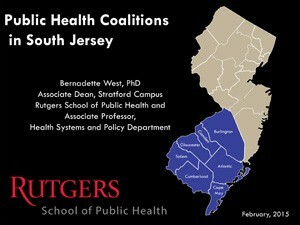 Dr. Bernadette West, Associate Dean for the Stratford/Camden Campus at the Rutgers School of Public Health, reviews key findings in the extant literature on coalitions and examines it as an organizing strategy to address public health issues within the seven counties of Southern New Jersey. She reports on the alignment of the goals and successes of these coalitions to the trends in key health indicators and notes priorities for the region. To accomplish this, she draws on information from the County Health Rankings, as well as community health assessments for each of the seven southern counties. Her research also includes interviews with key coalition leaders reporting on areas of both successes and challenges in addressing health outcomes. Dr. West concludes her report by recommending that coalitions “work smarter” together by sharing resources, avoiding duplication of efforts, and communicating a clear mission and vision that can be understood by more than public health professionals involved in the coalitions themselves. Page last updated by Senator Walter Rand Institute for Public Affairs at 1:49 pm January 9, 2018 . This page was printed from http://rand.camden.rutgers.edu/2018/01/09/public-health-coalitions-in-south-jersey/ at 4:05 PM Monday, April 22, 2019.